(Khan seen here shoving Peterson to the canvas with an elbow in the 1st round. No punch landed, just the elbow. The referee ruled this was a legit knockdown.) By William Mackay: I got a kick out of Amir Khan on Sky Sports Ringside recently. Without any real prompt from the Ringside analysts, Khan inserted foot into mouth when he blurted that he felt that not one but both of the knockdowns of Lamont Peterson should have counted last weekend. 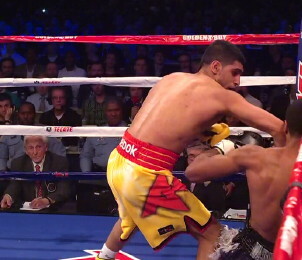 Khan got credit for the second knockdown, while the first was called a slip by the referee. Khan incredibly felt that both knockdowns should have counted. Even when a slow-motion replay was shown by Ringside where Peterson was clearly seen tripping over referee Joe Cooper’s leg on the first knockdown and also seen getting shoved to the canvas on the second knockdown, Khan still held firm with his belief that both knockdowns should have counted. Khan also said he saw the Peterson fight five times and felt he should have won it. A replay was then shown where Peterson was on the outside and Khan dove at Peterson and shoved him away before he could even get close enough to where his head was near Khan’s. That video took a lot of heat out of Khan’s argument that he had to push Peterson because he was coming in with his head. Khan also said he was he cleaner fighter, and Ringside then showed a clip of Khan shoving Peterson with his elbow outstretched. It made Khan kind of look more than a little silly. None of the Ringside analysts were disagreeing with Khan, but whoever was doing the video was hanging Khan over and over again.